Finally the flexibility you've been looking for! 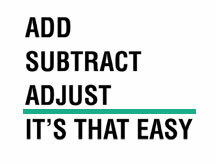 Add, subtract, or adjust shelves without disassembling the unit. YES! 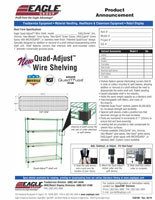 Quad-Adjust shelves can be added to existing units. Offered in all our standard finishes. Accommodates all our standard wire accessories. 800 lb weigh capacity for shelves up to 48" long (evenly distributed static load). 600 lb weigh capacity for shelves 54" to 72" long (evenly distributed static load).